"We wanted to bring the full experience to the audience, so I shot on film." 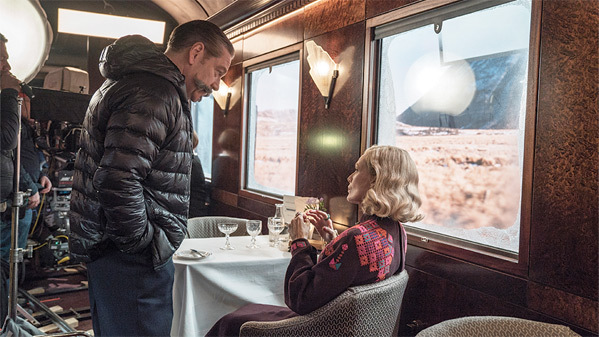 20th Century Fox has unveiled a featurette for Kenneth Branagh's Murder on the Orient Express, the murder mystery set on a luxurious European train. Branagh did indeed decide to shoot this on film, using 65mm for some scenes. This video is too short to dive into everything, but does have a few cool behind-the-scenes shots. Starring Johnny Depp, Michelle Pfeiffer, Penélope Cruz, Daisy Ridley, Josh Gad, Willem Dafoe, Kenneth Branagh, Judi Dench, Tom Bateman, Lucy Boynton, Olivia Colman, Miranda Raison, and Derek Jacobi. It's impressive to see they used a real train for a few shots, and I like the interior sets on a soundstage with screens down the side projecting what's out outside. This does seem like it's going to look stunning, at least. You can still watch the first trailer for Murder on the Orient Express here, or the second official trailer here.